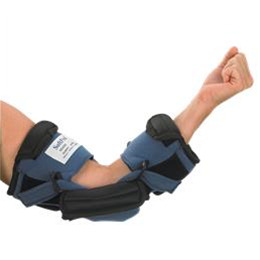 Ideal for providing positioning therapy for mild to moderate (< 90°) flexion contractures of the elbow. Double upright with single setting hinges which are set to provide the desired extension of the elbow. 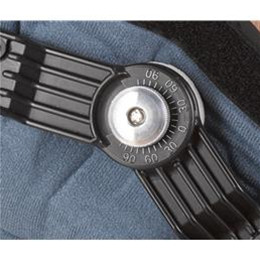 Rigid cuffs on bicep and forearm in soft cover; adjustable elbow cap. Soft, light, and comfortable, the SoftProÔ Static Elbow is excellent for maintaining range of motion or providing progressive extension therapy. Orthotic therapy to facilitate maintenance or rehabilitation of the elbow in the treatment of joint stiffness or non-fixed adaptive tissue shortening contractures of the elbow joint. A single setting double upright static brace that may be used to maintain end range or to incrementally restore range of motion through progressive extension stretching with frequent brace modification. The brace hinges can be set with 5° to 10° of additional extension from comfortable passive end range to apply a gentle stretch on the shortened tissue. The strapping system allows the fitter to initiate the gentle progressive stretch of the elbow as the elbow cap is applied creating a gentle extension of the shortened tissue. By increasing wearing time to three to six hours per use, the Total End Range Time (TERT) of device wear allows the shortened tissue to lengthen over time. The hinges must be frequently modified to maintain a therapeutic stretch of the tissue as device wear continues. Small SP 503-0 8" - 10" 7" - 9"
Medium SP 503-1 10" - 12" 9" - 11"
Large	SP 503-2 12" - 14"	11" - 13"
XLarge SP 503-3	14" - 17" 13" - 15"
Child	SP 503-4 5" - 7" 3.5" - 6.5"
Youth SP 503-5 7" - 10" 5" - 7"